The historic cemetery at Ringwood Manor is one of the oldest in the northern NJ area and is considered part of the historic site's exterior collections. Lying on a gentle rise, it overlooks Sally's Pond. It is not known how many people are buried here as no archaeological investigations have been done. Estimates range from 75 to almost 300. The earliest markers date to the mid-18th century. Many of the burial markers have suffered over time, exposed to the elements and at the hand of vandals, so that few original headstones remain. Among the cemetery are rows of plain field stones, some of which oral history says marks the burials of the unknown Continental soldiers who died along the old road here, not from battle but from disease and the rigors of time. The staff at Ringwood Manor often receives request regarding those buried at the cemetery. We have compiled various source materials and genealogical information here to help those looking for more information on their ancestors or the persons buried on the property. - married Rebecca Bird Morris, born 1781, died March 5, 1864.
together in West Milford in 1850. George Patterson, born ?, died January 13, 1851, age 48 years, 4 months, 25 days. Home in Pompton, NJ in 1840. William Stalter, born 1823, died November 15, 1871, age 45 years, 8 months, 1 day. Married Phebeb (Pheobe?) A. Stalter, born June 1827. - son, Johannes Lucas Wessels, b. September 6, 1754, d. ? - son, John Lucas Wessels, b. November 24, 1785, d. ? - son Richard Ziegner, Jr. b. 1937? Barbara’s great great great great Grandfather, Lucas Wessels, who was uncle to the Ryerson/Ryersen family, is buried at Ringwood Manor. 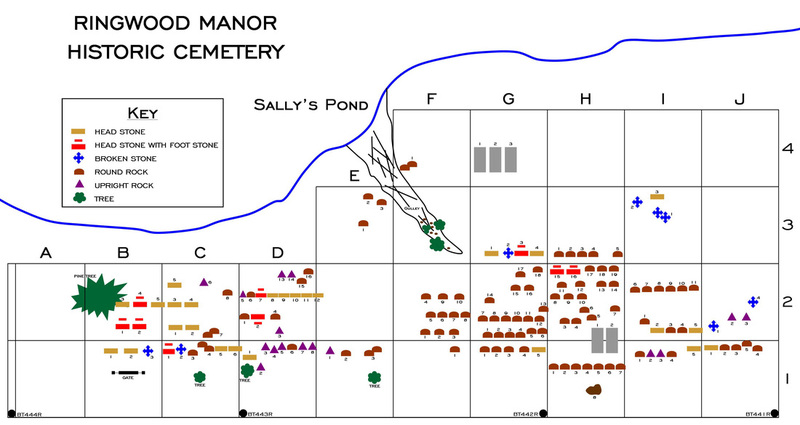 The map below is based on one of the earliest attempts to inventory the historic cemetery at Ringwood Manor. The map can be saved and printed. The document directly below it is the key to each quadrant. Please note that the map is not to scale and that natural features such as trees indicated on the map may no longer exist at the cemetery.